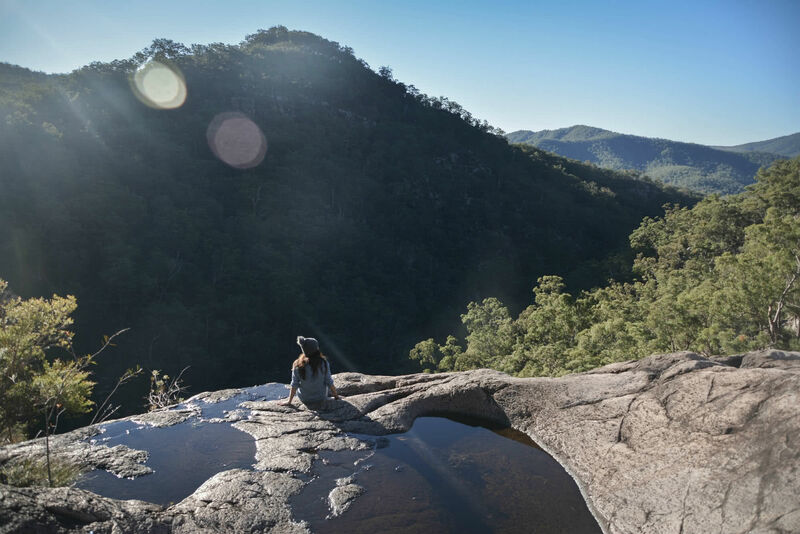 If you’re a keen hiker and live in South-East Queensland, no doubt you’ve heard of Mt Barney’s Lower Portals and visited once or twice. But have you adventured beyond the Lower Portals to explore Barney Waterfall…? Behind the Lower Portals lies a pretty, boulder-strewn creek with rocks bleached by the sun and water. Even further on you’ll find the Moonlight Slabs. The Moonlight Slabs are – you guessed it – stretches of rock slab rendered smooth by regular water flow. The slabs stretch from the top of the Barney Waterfall, which is not really a waterfall most of the year, but clear pools of water leading to an epic viewpoint. To get there, you’ll need to get your rockhopping on. 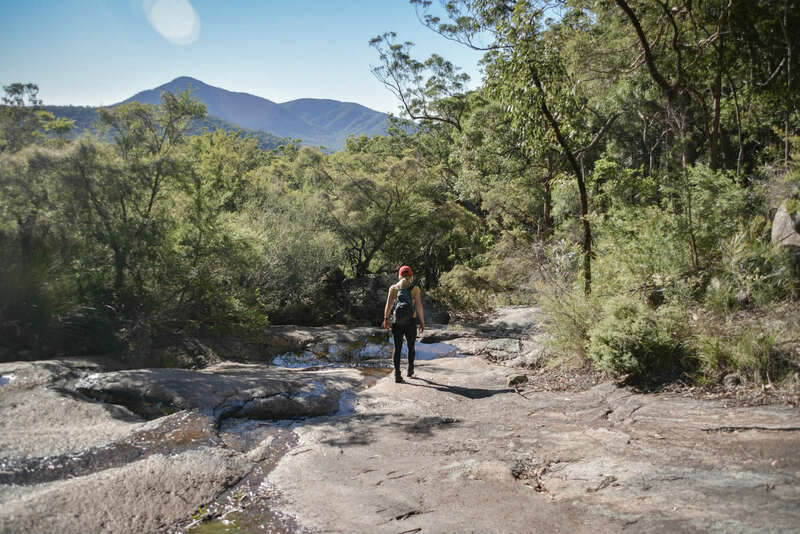 The hike up to Lower Portals is on a maintained bush track that winds up and down small hills and over twisted tree roots, and cuts through creeks. The hike up to the portals is 3.7km one way. Once you get past the Lower Portals, you can rockhop to your heart’s content as you wind upstream. You’ll also cross the creek a couple of times as you negotiate your way along. Be warned that in winter the water is freezing! But in the summer months it’s the perfect place for a dip. Once at the base of the Barney Waterfall, which may or may not be flowing, take the rough footpad up the left side to get to the top. You can stop here or tackle the smooth rock and head up a little further for some exploration along the rock slabs. Water has worn the rock slabs smooth so make sure you have some grippy shoes and have some rock scrambling skills if you plan to do some explorations. You can reach The Lower Portals from the carpark at the end of Lower Portals Road. To reach this road from Brisbane, take the Mt Lindesay Highway to Beaudesert, turning right at the traffic lights and heading towards Rathdowney. Just past the Rathdowney township, turn right on Boonah-Rathdowney Road and then turn left onto Upper Logan Road. Look for Lower Portals Road on your right and follow the signs to Lower Portals. The hike starts from the carpark, so follow the signs. After you reach the Lower Portals, the route is not signed. 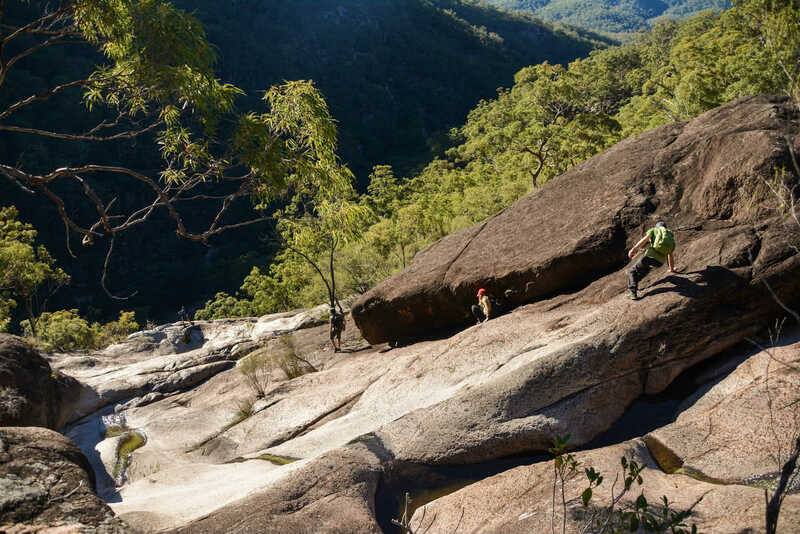 To reach the Moonlight Slabs and the rock face of the Mt Barney Waterfall, you have to get around the Lower Portals. Just before you hit the Lower Portals, there’s a rough track to your right which will take you up a hill. 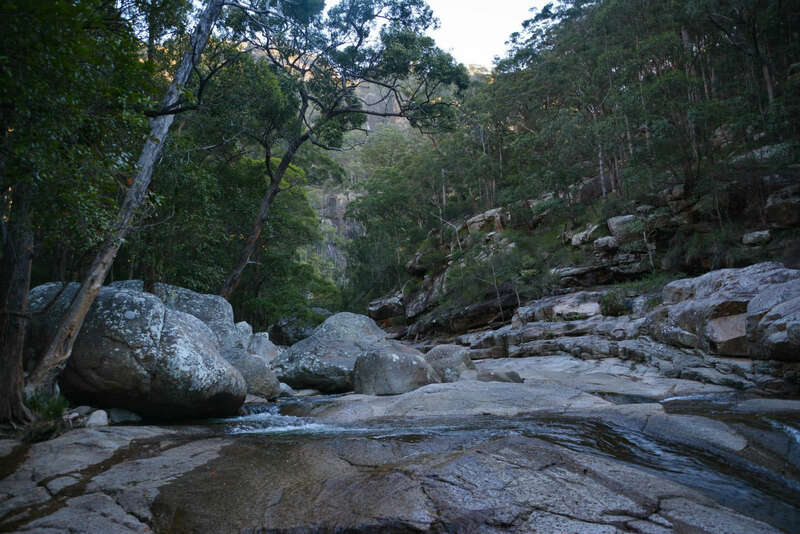 You can then get back down to the creek from here and rockhop down the creek for about 45-60 minutes You can’t miss the rock face to your left that is the Barney Waterfall with a view of Mt Barney looming behind it. Intermediate. 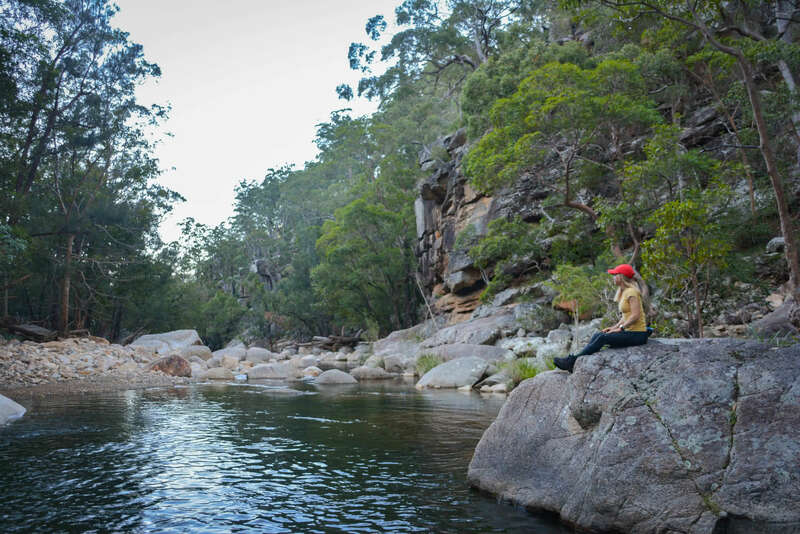 While the distance isn’t that far, you’ll need to be a fit, experienced hiker to negotiate your way down the creek and then up to the top of Barney Waterfall. Some navigational skills wouldn’t go astray either to find your way around the Lower Portals and up to the Moonlight Slabs. About 10km return from Lower Portals carpark. Allow about 5-6 hours. 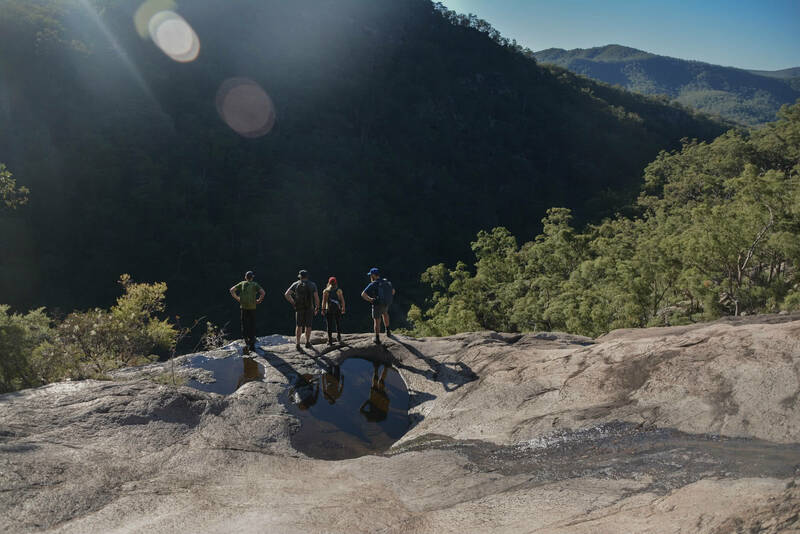 Looking For More Hikes Around Mt Barney?